Two Dogs Taproom is an ambitious project to create the second brewpub in Tokyo. 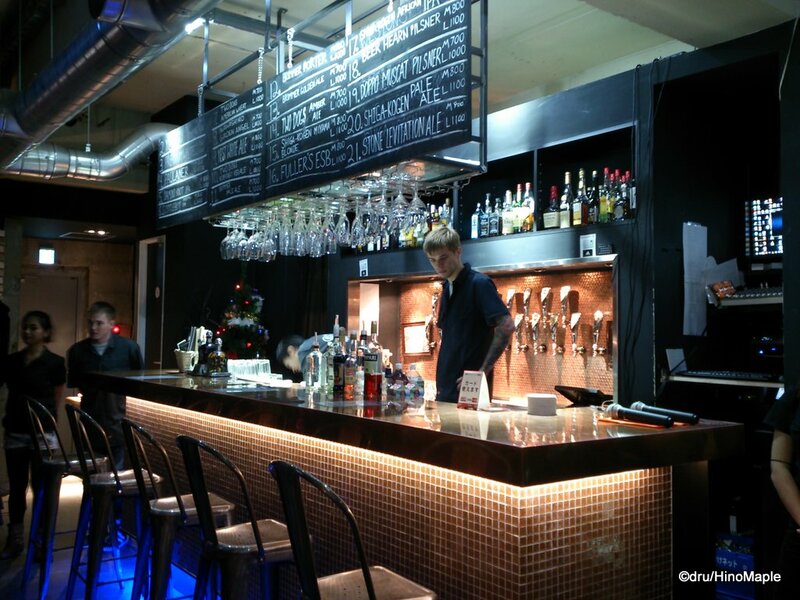 There are a few taprooms in Tokyo but many of those companies don’t make their beer in Tokyo. Two Dogs aims to take on T.Y. 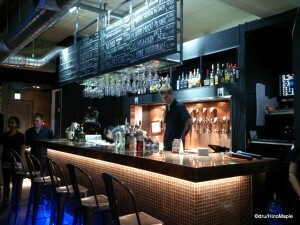 Harbour; the only other brewpub based in Tokyo which opened in 1997. Two Dogs opened at the end of October 2013 in the heart of Roppongi’s club and bar district and I visited them in mid-December 2013. Two Dogs is located in a prime location just off the main street with a lot of potential to pull in a lot of business. They are located far enough that it is a little quieter but it can also cause problems bringing in more people as it is not so easy to see from the main street. In general, their business model seems pretty sound but they definitely show signs of being a new company that had rushed to open rather than opening properly. Update: I was told by Mark, in the comments below, that Two Dogs is not yet a “true” Taproom. I don’t doubt that the owners created their own recipes for their own beer but they are contract brewing under Brimmer Brewing. Without anymore information, I cannot verify if they do their own brewing, watch the fermentation, and do the bottling on their own or not. I can only say that I hope they build upon their humble start and grow quickly to be more independent. I must give a full disclaimer about this post as my visit to Two Dogs Taproom was influenced by the fact that I was there during a party and we reserved the entire taproom. We were given a course of food as well as an all you can drink menu. 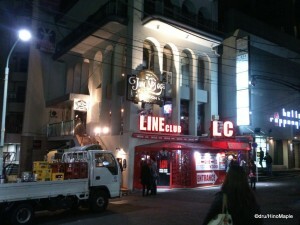 My experience was affected because Two Dogs only has Yebisu beer with their all you can drink course. I like Yebisu beer, but for a taproom to offer an all you can drink course and not offer their in-house beer was a bad point on the taproom. They also charged full price for all of their craft beers on tap regardless of where it was produced during the party. I was appalled that they didn’t even over a slight discount of 10-20% during the party for the beers that they produced. 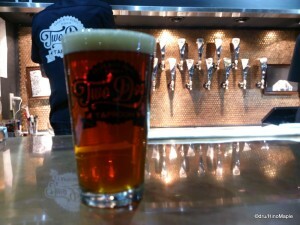 This is another post about a brewpub, so let’s start with the beer. Two Dogs had 3 of their own beers on tap when I visited. I had a choice between the American Wheat, Amber Ale, and the Red Ale. I asked the barkeep for the hoppiest draft they had that was their own beer. I was shocked that they didn’t know or didn’t want to explain the flavours of their own beers. The guy I ordered from had no idea what to recommend and asked another guy for advice. He recommended me an IPA that wasn’t from their tanks. I rephrased my question and asked about their beers specifically and they said the “Amber Ale was the strongest”. I was disappointed in their lack of knowledge of their own brews; rather their inability to explain the flavours to me. I went with the Amber Ale anyways and it was a nice selection. It was a balanced beer that has a nice level of hoppiness. I wasn’t very impressed as it was only on par with most of the other craft beers I had from other breweries in Japan. In the last year I have been improving my palate so that I could understand the different tastes within beer itself. I am no expert but I know what I like. I was neither impressed nor let down by their beer, but my expectations were high. It is still better than most of the beer that you can get in the supermarkets. For the party, they had a buffet style dinner and kept the food coming, but their kitchen was overwhelmed by the number of people trying to eat at the same time. They have a good kitchen and the small amounts of food that I could get was pretty good. There was a variety of deep fried fish, some wedge cut potatoes, wings, and other American brewpub dishes. They also had good pizzas cooked in a wood fired oven, but those were taken faster than they could make it. The design of the actual taproom was pretty good. 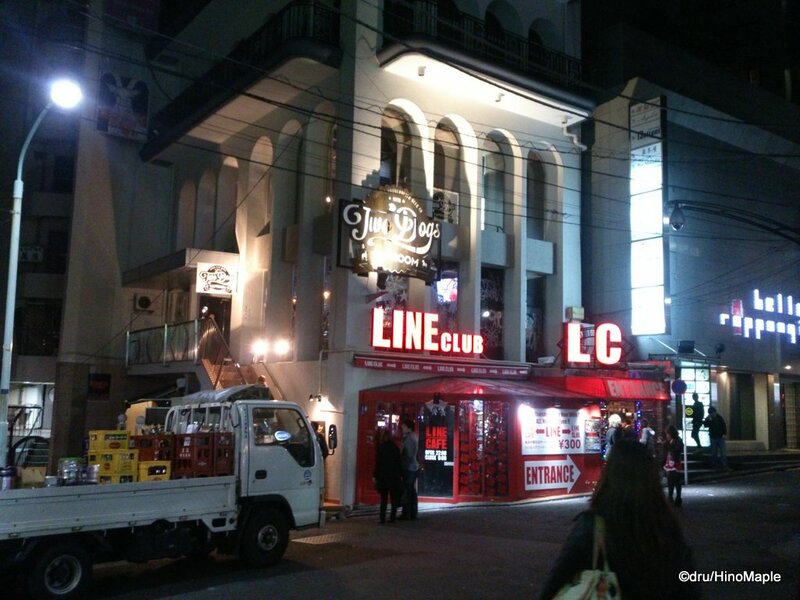 They have 2 levels with the bar on the first floor and the kitchen and restaurant style seating on the second floor. The second floor is a more intimate and quieter area of Two Dogs and you can see them making their pizzas and other dishes in the open style kitchen. The overall design and look of the taproom was great and they put a lot of thought into making things look very American. Even the servers and bartenders were noticeably foreigners providing a taste of American service in Roppongi. There are many problems with Two Dogs but the biggest problem when I visited was the food service during their parties. It was a bit of a mad house at times as people lined out the stairs on the second floor and people were just crowding the buffet table waiting for food to come out. This is due to the fact that I was there for a party so their actual regular service is probably a lot better. I also had a big problem with their servers. They really advertise that they provide an “American” experience but the owners didn’t train their servers to also take the good points of Japanese service. The servers often had an “I don’t care” attitude mixed with a friendly and playful attitude. They didn’t look organized and looked primarily occupied with each other as well as trying to see what crazy things the people at the party were doing. They also came off as being uninformed. Their taproom needs to be able to explain the flavours of their beers, and at the very least the flavours of the beers they produce. Two Dogs has the potential to be a great place but they really show how young they are. The place looks great and it can easily be packed every weekend. They worked a lot on looking good but they lack the ability to follow through on their promise. 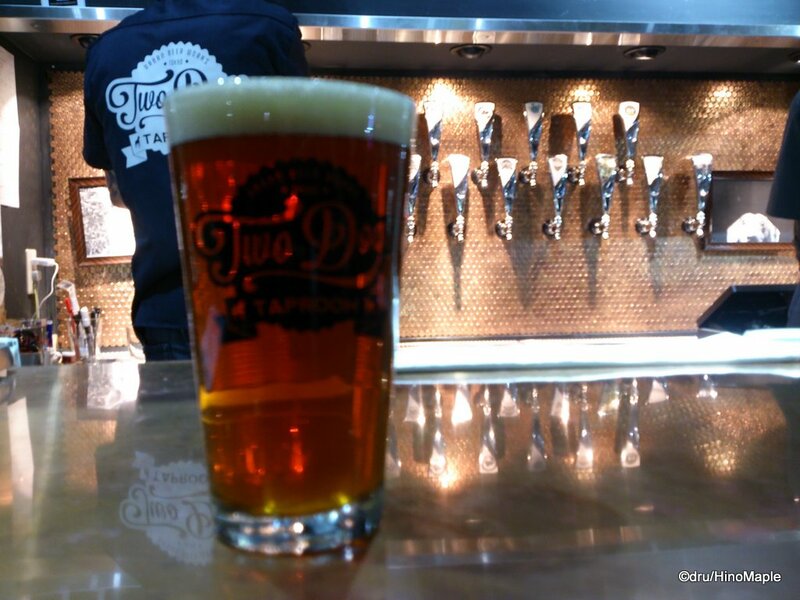 The entire taproom felt rushed as they didn’t pay attention to the details. For example, the list of beers available features Yebisu beer as the #1 beer and Sapporo Premium White as the second. I can understand why as they probably have a contract with Sapporo which requires them to put Sapporo beer at the top, but to have Paulaner as the third beer on the list is pretty silly. Their own in house beers were listed at 4, 9, and 13 respectively. Out of these, only #4 is listed at the top end of the board, so they obviously didn’t put enough thought into this. I feel like the servers at Two Dogs didn’t know what the beer tastes like and probably never tried it. Rather than telling me the flavour notes of their beers, they just said “this is the strongest”. The same problems continue if you visit their website. The website looks beautiful but there are little things they didn’t do properly. Trying to click on any of the menu items requires patience as they created text links and you have to click on the text rather than an imaginary box around the text. The background image looks great and goes with their image but it is static so as you scroll up and down the page, the background image doesn’t move. It looks clunky from a design standpoint but they had the right idea. They also committed a cardinal sin when it comes to creating a website. They have bad links. This website is not perfect but I worked hard with my design team and they created a uniform look and all of the links work. There are no buttons or links that link to something that doesn’t exist. Two Dogs really dropped the ball by not placing the proper social media links; instead they left links to social media for a company called Wix. Wix is a website building company where you can use their tools to create your own website. This works for small companies but Two Dogs didn’t bother to check their own links or kill the links. It appears they are using a template and they forgot to remove the things that weren’t needed. Some of the links are also inconsistent with the design flow. Like their taproom, the website looks like a rush job. Update (2015-10-19): Two Dogs have updated their website since the time of writing this post. They have changed everything that I had an issue with and looks a LOT better. Do note that this was originally posted on 2014-02-23 and had all of these problems at that time. The potential at Two Dogs is there, but they show a lot of problems at the same time. I still want to return and give the taproom a better go as a regular customer but I think I’ll wait till the servers have a lot more experience and the beer they make has matured a little more into something they can call their own. I will try to return later in the year but unfortunately they had so many rookie mistakes that I may wait another year and try the other taprooms around Tokyo before I return to Two Dogs. 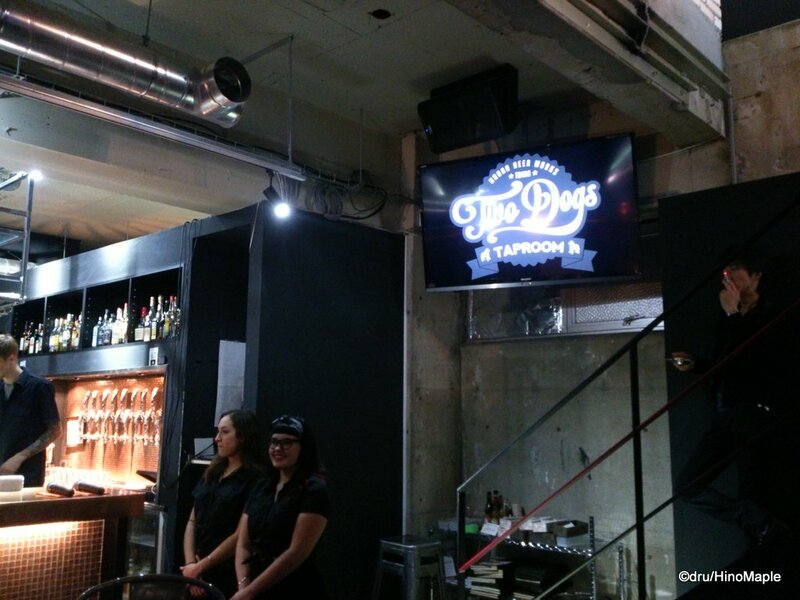 This entry was posted in Tokyo Food and tagged Bar, Brew Pub, Brewpub, craft beer, japan, pub, roppongi, Taproom, tokyo, Two Dogs, Two Dogs Taproom by Dru. Bookmark the permalink. Yebisu is a premium beer in Japan and quite expensive. I’ve never seen it up on an all-you-can-drink menu. Perhaps your budget didn’t afford you Craft Beer. I’ve been to Two Dogs and had a better experience than you it seems, but a few things here aren’t accurate. They contract brew with Brimmer. I don’t know about Brimmer’s system, but Baird Brewing as with most breweries charge an extra 10% on top of the regular beer prices, just to put your name on it. So I’m confused as to why you think, you should get a discount. Also you said “They charge full price for their beers, no matter where they are made”. That’s just not true. Not a very good write up in my opinion and I liked the staff too. I’m afraid we will have to disagree, although you do bring a bit of information that does change the way I see things. Do you have insider information that I am not privy to? I wrote this post as an independent observer with no ties with the company. I visited with no prior knowledge to the establishment and never interviewed them as I am trying to keep this as unbiased as possible. All of the information I have here is readily available on their website and I based this post on the information available there. Yebisu beer is considered a “premium beer” in Japan and I have seen it on all you can drink menus before. It isn’t as common as Kirin and Asahi, who have the largest market share but I often see it in restaurants and bars. That said, Yebisu is NOT a craft beer. It is made by Sapporo and under conditions that would not qualify it as craft. Yes, you can argue it is a premium beer, but not to the level of a craft beer, or ji-biru. Also, it is not expensive. Craft beer is expensive. A can of craft beer is over 300 yen, and a can of Yebisu is on average around 270 yen. On tap, Yebisu is as cheap as 300 yen in certain places, but an average of 700 yen. Prices depend more on the type of establishment rather than the beer itself. Craft beer tends to be about 1000 yen a pint and 700 yen a glass. You mention that my budget didn’t afford me craft beer. I feel that is very condescending and hurtful. Are you assuming I am a poor person or a cheap person? I did pay full price for “their” beer as I wanted to try it. I was not the organizer of the party and if you read the full disclaimer that is in the second paragraph, I mentioned that my own impressions were a bit biased. Do note I recently updated it as well. Hopefully it is clearer. This is misleading in the sense that they don’t mention they brew at Brimmer or contract out their brewing. Brimmer is a good brewery and I like their beers. If Two Dogs has to brew their own beer at a 10% premium, they should still be able to afford to knock off a small percentage during a big party where I already paid for the all you can drink and food course. I paid for the beer, at full price, on top of the drink and course set price. If they are not making 30-50% markup on their beers, as I have heard is fairly standard in the restaurant industry, they are not doing their business correctly or their costs are too high. I think you misunderstood what I meant by a discount. I was talking about a discount DURING the party, and not all the time. If you did understand what I was saying, then I’m afraid I have to disagree with your line of thinking. A “brewpub” that has a party that serves only Yebisu, not their own brews, for an all you can drink should discount their “own” beers. This is good in a marketing sense and a business sense. I am not consuming the Yebisu that was available and I’m not being a burden on their beer operations. At the very worst they would break even on the cost of the beer, including the cost of cleaning the glasses. The cost of labour would be the same in either case and unless I break their glass, there shouldn’t be a problem. They would still be making, assuming they have a 30% markup, 20% on each pint. As for the staff, again, the disclaimer at the top covers that. It was a big party so I didn’t expect the staff to be attentive to my needs. It was one of their first set of parties so they didn’t have a good system at the time. I visited Two Dogs in early December, about a month or so after they opened to the public. The knowledge of the workers there is hopefully a lot better by now as well. WHEN I go again as a regular customer, I will definitely reevaluate things. I’m sorry you don’t think this is a good write up. I made it as clear as possible to state that I was not in a standard situation at the restaurant and I also didn’t have as much information as you. Either way, you are entitled to your opinion and thank you for sharing.